I am here in Goa for our much awaited priceless annual vacation and over the years I have seen how slowly the massive mesmerising pristine sea green water bodies here are gradually loosing their sheen under the dense clutches of water pollution. The day isn’t far when we loose such wonderful marvels of Mother Nature to manmade chemicals and pollutants....and it really hurts. Back home in Pune, I read a similar piece in the newspaper which spoke about the heart breaking fact that the city would soon be having zero potable water. Well, the number of water cuts in summers for the past few years have already been speaking the gruesome story. If this is the state in one of themost posh locality where I reside, I wonder how the economically weaker sections of society fare in such situations. All I know is how my house help is always late to work because she has to stand in long queues to grab a few pitchers of drinkable water. 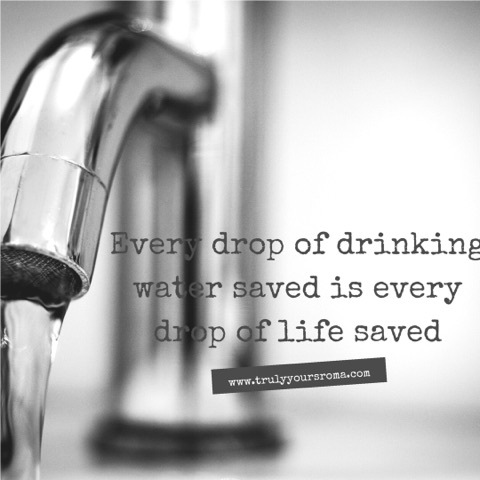 Personally I ensure not a drop of water is wasted as I believe that every ounce of drinking water saved, is every ounce of life saved. So when I laid my eyes of the #CuttingChai initiative of Livpure, I had to immediate satiate my soul by knowing more about it and do my bit in spreading this lovely concept. I was impressed by the thought process behind the idea and wanted to do my best first before spreading the meaningful message which we unknowingly miss on our daily life. How many times do we simply drain the drinkable water because we have already sipped our need and render it a waste that too when a larger section of our mother nation walk miles to just have a little?? Thus, I first shared it with hubby and sonny that now we will categorically fill out glass only with the amount of water we wish to drink and if some is left we will use it to water our plants and give it back to Mother Nature in it’s purest forms. We will always keep bottles with us and drink as and when needed rather than buying a lot of mineral water bottles wasting half the drinkable water and also loitering around the plastic wastes - the bottles. While the little one looked so keen and interested that he immediately shared the message among the people sitting on our adjacent beach pads. Thereafter, as we entered the shacks for some quick bites I was reminded of the lovely video below and we asked the waiter to serve only cutting pani to all instead of full glasses and surprisingly everyone there agreed unanimously😊. People today are much more understanding and tolerant and really understand how significant it is for us to conserve our natural resources, drinking water undoubtedly topping the list. This is when I decided to share this profoundly conceived initiative from Livpure called #CuttingPaani with my precious readers here too♥️. You remember how Mumbaikars have glorified the concept of cutting chai to soother both their pockets and taste buds, similar is the idea behind here. Pour for yourself only what you want or else finish that extra bit to do yourself a calorie free nutritious favour. Come what may don’t waste, better still pour it in your pets’ bowls or in aquariums. Incase of bigger gatherings or parties collect the unused water and the same can be wonderfully used to mop our floors or wash clothes with some disinfectants in them.